The group’s main interests are the mechanisms underlying synaptic transmission and gliotransmission, and the role of metabolism and energy supply for the function of gray and white matter. These mechanisms are studied in normal and pathological conditions, and during ontogenetic development and ageing. Recent research by our group (see Achievements) has opened possibilities for studying in depth aspects of nervous system functions in health and disease. Important aspects are how nerve endings provide glutamate for synaptic release and how they recover released glutamate for reuse, as well as how synapses provide energy for synaptic transmission and how astrocytes can modulate neuronal function. Our main aim is to study synaptic function under physiological conditions and to investigate how the factors contributing to normal signalling are altered in disease, identifying new therapeutic strategies. Identification of gliotransmitters and their roles in neuron-glia communication. Role of metabolic precursors of glutamate, including glutamine, for keeping up synaptic release. Interplay of glutamate with other neurotransmitters (e.g. aspartate, GABA, dopamine), including experimental models of neurological disease (e.g. Parkinson's disease, epilepsy, ADHD). Roles of lactate in synaptic transmission and myelinisation studied in monocarboxylate transporter knock-out mice, as well as in experimental models of heart failures and epilepsy. Synaptic changes during ontogenetic development and in animals with deficient DNA repair. Glutamamine transporters, SN (Cell 1999, EMBO J 2001, Eur J Neurosci 2002, Glia 2003, J Am Soc Nephrol 2005) and SA/SAT (PNAS 2000, J Neurosci 2002, J Cell Biol 2002) were molecularly identified and characterized. A role of glutamine has been defined for normal synaptic function (J Neurochem 2008) as well as dendritic retrograde signaling (Cereb Cortex 2009c), and a potential target uncovered in Alzheimer’s disease (Neurochem Res 2008). The ultrastructural localization of monocarboxyltate transporters (Cereb Cortex 2005, Neuroscience 2007a) as well as identification of glutamate transporters in glia (Glia 2008) and in nerve endings (Neuroscience 2008) provides new approaches to understanding brain function. The identification of proteins, VGLUT1-3 (Neuron 2001, PNAS 2002), that pump glutamate into synaptic vesicles allows the packaging of the transmitter to be characterised in health and disease (J Comp Neurol 2004, 2006, 2007) and modified by gene knock-out (Science 2004). Astrocytes, triggered by e.g. purinergic receptors (Eur J Neurosci 2007), release glutamate from VGLUT containing vesicles to enhance synaptic efficacy (Nature Neurosci 2004, 2007, Neuroscience 2009a). The observations that astrocytes and even non-neural cells (J Cell Sci 2004, J Lipid Res 2007) store and can release neurotransmitter amino acids in a way resembling synaptic release, and that oligodendrocytes have NMDA type glutamate receptors (Nature 2005), together with findings that glutamate and other neuroactive substances can be co-released from nerve endings (Eur J Neurosci 2003, Molec Neurosci 2004, Cereb Cortex 2009a), including at the neuromuscular junction (Neuroscience 2007b), suggest novel ways of intercellular communication and potential drug targets. Observations in synapsin knock-out mice that develop epilepsy (Neuroscience 2005, Cereb Cortex 2009b) and in a rat model of ADHD (Neuroscience 2009b) implicate anomalous glutamate signalling in these diseases. Ionotrophic glutamate receptors are implicated in nociception (Mol Neurobiol 2009), and mediate signals that position mitochondria where they are most needed, i.e. at the postsynaptic site of active synapses (Neuron 2009). Inducible expression of a mutated mitochondrial UNG1 DNA repair enzyme in forebrain neurons caused generation of apyrimidinic mDNA and neuronal impairment including reduced size of synaptic contacts (Mol Cell Mol 2010). Eccentric muscle actions cause ultrastructural changes in human subjects (J Appl Physiol 2009 a, b). Increased MCT1 expression after ischemia and reperfusion restore cardiac pH through lactate export (Life Sci 2009). Review of the literature underlines a role for vesicular release of glutamate from astrocytes in synaptic transmission (Neuroscience 2009a). Symposia were published, on the glutamate synapse (Neuroscience 2009c), and on synaptic plasticity and memory (Neuroscience 2009d). 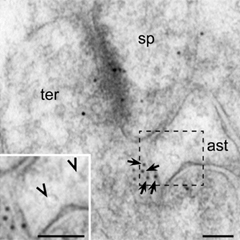 Electron micrograph showing NMDA receptor subunits NR2B (immunogold particles) at the synapse as well as in extrasynaptic membranes (arrows) of nerve terminals (ter) making asymmetric synapses with dendritic spines (sp) in the dentate molecular layer. NR2B particles face astrocytic processes (ast) that contain synaptic-like microvesicles (SLMVs, arrowheads in inset) in close proximity. Scale bars, 100 nm.